#ALDUBRoadToForever Unlike previous episodes, the ALDUB Road to Forever opened with some specific instructions regarding the upcoming ALDUB Sa Tamang Panahon event at the Philippine Arena. Not everyone can make it to the Philippine Arena on October 24, 2015. But they would still like to donate to The ALDUB Library Project. As of this writing, BDO Universal Bank is setting up an account intended to receive donations from inhabitants of the ALDUB Nation residing outside the Philippines. Specific instructions will be given on the episodes to follow by the KalyeSerye commentators themselves. The ALDUB Road To Forever episode also mentioned the number of chairs assembled from the donated plastic bottles as of October 19, 2015. 47 plastic chairs were made as of the ALDUB Road To Forever episode. Eat Bulaga will have a live telecast on Saturday by 11:30am. But the Front Act starts at 10am. So arriving at the Philippine Arena as early as possible is highly recommended. Boss Joey warned everyone about scalpers and saboteurs. Tickets go as low as Php150 as shown on the Ticket World website. With the announcements done, the KalyeSerye commentators – Senator Tito, Boss Joey and Allan K – shifted their attention to the developments in the KalyeSerye. Donya Tinidora had just arrived on the set on the ALDUB Road To Forever episode. Senator Tito can’t help but observe. “Bakit papayat nang papayat ang mga Cuando mo?” (How come your Cuando’s are getting skinnier?) “Hay naku, Tito Sen. Cuando? Bangkay? Natural! Wag pakainin!” (Of course, Tito Sen. Cuando? Corpses? Naturally! Don’t feed them!) “It’s a Happy Monday. Graba, hindi na ko makatulog kasi 5 araw na lang ang tamang panahon.” (Damn, I can’t sleep since it’s only 5 days until the right time.) For an educational fund-raiser, it generated a lot of excitement. 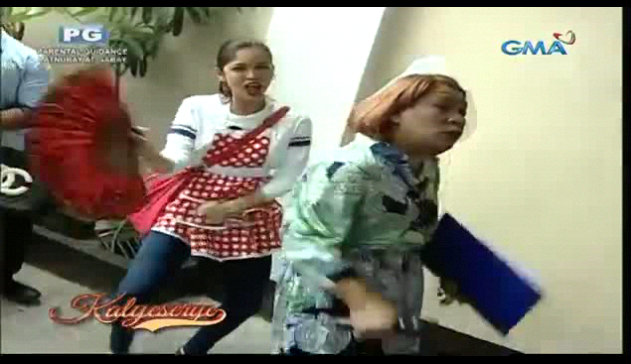 The ladder skit was still present at the ALDUB Road To Forever episode. But Donya Tinidora’s somewhat demure behavior in this episode was evident. She managed to explain herself though. “Naghahanda na kami. Siempre. Hindi basta-basta ito. Ito ay buong mundo. Yun ngang mga dance lessons ko, hindi ko na inaatenan.” (We are preparing. Of course. This is not just any event. This is worldwide. I don’t even attend my dance lessons anymore.) That partly explained the mellowed dance moves. Donya Tinidora shifted her attention to her zombie army. “Kayong Cuando Cuando Cuando ha? Mag-ready na kayo. Yung pinakaguapong barong. Kelangan yun ang isuot ninyo. Siguro mukha na lag ang palitan. Wag na yung barong.” (You Cuando Cuando Cuando? You all get ready.The best barong. You should wear that. Maybe just replace your face. Not the barong.) Senator Tito suggested a barong with a bigger back slit at the ALDUB Road To Forever episode. Donya Tinidora agrees. She continued with the instructions in the ALDUB Road To Forever episode. “Kelangan naliligo kayo. Hindi puede yung ganyan. Amoy alimuom kayo lahat. Maligo kayo. Yung pinakaguapo at saka isasama ko kayo sa Philippine Arena. Wag kayong malikot. Behave!” (You should take a bath. You can’t go looking like that. You all smell like crap. Take a bath. Wear the best and I would take you to the Philippine Arena. Don’t move too much. Behave!) She somewhat ended up sounding a little like Lola Nidora. Only with more sarcastic instructions. Donya Tinidora insisted that Lola Nidora is adorable today. “Alam mo pag sinabi kong pangit ka, pangit din ako. Magkamukha tayo eh.” (If I said that you’re ugly. I’m ugly too. We look similar.) She then tried to shift the attention to YayaDUB. She asked for preparations underway in the mansion by askin YayaDUB to talk. YayaDUB simply DUBsmashed “I’m so excited. And I just can’t hide it.” The ALDUB Road To Forever episode showed all 3 characters present so far as happy and excited. Shortly, Alden was shown on the next monitor. Donya Tinidora acknowledged his presence. “Ayan na ang lalaking saguiguilid.” (Here comes the guy on the sidelines.) Alden DUBsmashed Bruno Mars’ “Just The Way You Are”. YayaDUB replied by DUBsmashing M2M’s “Pretty Boy”. Alden then DUBsmashed True Faith’s “Dahil Ikaw”. It was a cute DUBsmash exchange in the ALDUB Road To Forever episode. Since they were having fun with DUBsmash at the ALDUB Road To Forever episode. YayaDUB requested. “DUBsmash tayo.” (Let’s DUBsmash.) Even the KalyeSerye commentators are excited to see it again. Alden and YayaDUB then went for the Malaysian rant for DUBsmashing. Donya Tinidora tried to copy it. But Senator Tito ended up hearing cuss-like sounds. “Tinidora, parang nagmumura ka na ah.” (Tinidora, you sound like you’re cussing.) Donya Tinidora denied it. Alden and YayaDUB then DUBsmashed Busta Rhymes shortly. Alden then lend Baste his clipboard. Baste then tried to write what’s on his mind. After writing, Alden let Baste show YayaDUB what he wrote. YayaDUB smiled. Her smile at the ALDUB Road To Forever is enough to make him smile too. Boss Joey tried to interpret Baste’s message. “Bulate ka ba? Eh kasi kung saan saan ka nagsususuot eh.” (Are you a worm? You like inserting yourself in several places.) Besides Boss Joey thought that Baste likes inserting himself in several places anyway. Like between Alden and YayaDUB in the ALDUB Road To Forever episode. This motivated Baste to DUBsmash Ed Sheeran’s “Thinking Out Loud”. [There is no microphone close by so no opportunity for him to sing.] YayaDUB replied with her DUBsmash. “You’re my honey bunch sugar plum yummy yummy pumpkin. You’re my sweetie pie.” Donya Tinidora interrupted them briefly for another set of questions. Baste then left Alden’s den to go to the next room. Lola Nidora drove the topic back to Isadora. “Mabuti nga at nagbago na si Isadora. Di ba dati, malimit agaw eksena yan noon. Ibang iba na sya. Masayahin na si Isadora. Dati napakasuplada nyan. At napakasuwail. Lahat ng bawal ginagawa niyan.” (Good thing and Isadora has changed. Remember then, she often gets the attention. She is so different now. Isadora is now a cheerful person. She used to be such a snob. And very rebellious. She would do all that is not allowed.) Donya Tinidora asked in what way was Isadora rebellious. The ALDUB Road To Forever episode served as a way to explain Isadora’s sketchy reputation. Lola Nidora cited a few examples. “Pag sinabi mong kaliwa, pupunta sa kanan. Pag sinabi mong bawal umuwi ng late, naku, uuwi yan ng umaga.” (If you say left, she would go to the right. If you tell her not to come home late, she’d be home by morning.) The other examples that Lola Nidora suggested that Isadora might be suffering then from oppositional defiant disorder (ODD). Then she mentioned other hissy fits that Isadora did in the past. At the ALDUB Road To Forever episode. Lola Nidora was just laughing them off. But most of what Lola Nidora remembered about Isadora involved their mother. “Hay naku, sobra yang si Isadora. Pinaluha niya ang Mama. Pati ako pinaiyak niyan. Natatakot kasi ako sa anumang iniisip niya. Pero kailangan nating harapin ito, Tinidora.” (Oh, dear, Isadora is too much to handle. She made Mama weep. She made me cry too. But we need to face this, Tinidora.) YayaDUB tried to appease Lola Nidora with her DUBsmash. 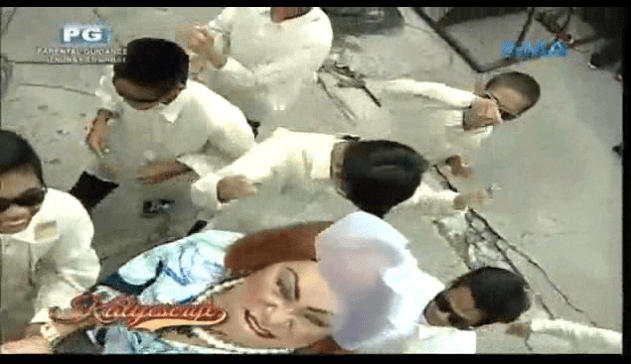 But instead, Lola Nidora had a mini-heart attack at the ALDUB Road To Forever episode. 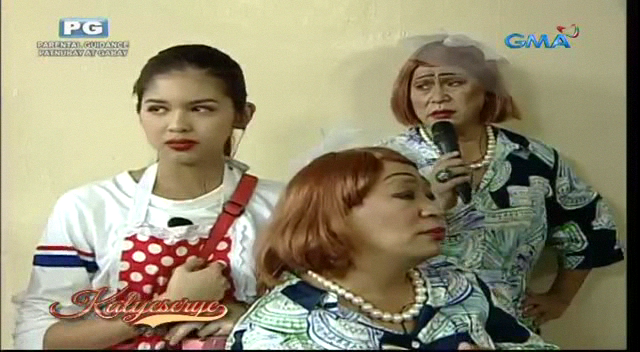 Lola Nidora continued with her reminders at the ALDUB Road To Forever episode. “Mahaba-haba pa ang lalakbayin nyo ni Alden. Nagsisimula pa lang tayo.” (You still have a long way to go with Alden. We are just getting started.) Boss Joey suggested a sneak peak to ALDUB Road To Forever. “Gusto mo ilitanya ko? Sa Sabado, tamang panahon. Tapos magbe-brithday si Alden. May Valentine’s Day pa. Yung unang Valentine’s nila. Kawawa ang kalaban.” (You want me to say it? On Saturday, the right time. Then Alden’s birthday. There’s even Valentine’s Day. Their first Valentine’s Day together. Poor competition.) Donya Tinidora simply reacted. “Ikaw na!” The studio audience chanted Boss Joey’s name. After the Sugod-Bahay segment. Lola Nidora reminded Donya Tinidora one thing too. “Tinidora, kailangan magpatahi tayo ng bagong outfit para sa Sabado.” (Tinidora, we need new outfits made for Saturday.) As Donya Tinidora makes the KalyeSerye commentators guess her outfit, another vehicle arrives at the ALDUB Road To Forever episode. It was Isadora arriving to the tune of Big Bang’s Fantastic Baby. Later she shifts to Los del Rio’s “Macarena”. Isadora continued. “Ikinalungkot kong lubusan yan dahil tatlong taon siyang nag-labor. Malaking bata ka noon. Batang-bata pa nun siya, hija. Mga 18 years old pa lang. Eto ang larawan ng iyong nanay.” (I was incredibly saddened since it took 3 years for her to go into labor. You were a big baby then. She was very young. About 18 years old. This is the picture of your mother.) And Isadora pulled out Ursula’s photo. [An almost recent photo of Maine Mendoza.] 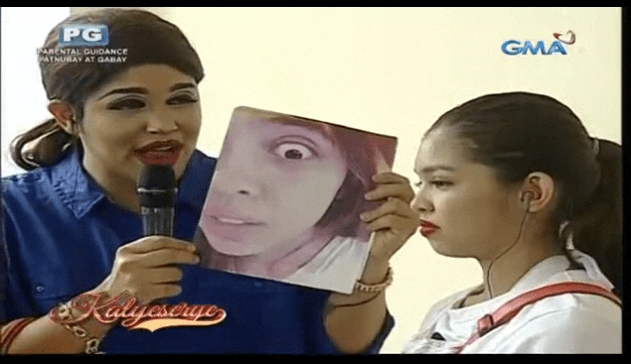 Divina a.k.a YayaDUB looked closely at the photo at the ALDUB Road To Forever episode. She agreed that she really looked like her mother. Donya Tinidora then asked what most viewers of the ALDUB Road To Forever are now asking. “Apo natin si Divina. Totoong apo natin siya di ba? Pero bakit kailangan pa nating palabasin na siya ay isang Yaya? Yaya ni Lola? Bakit?” (Divina is our grandchild. She is OUR grandchild. But why do we have to make it look like she’s a nanny? Granny’s nanny? Why?) Isadora then motioned to Lola Nidora to come clean. Why is their grandchild now the household nanny? Looking back at the ALDUB Getting Closer episode. Donya Tinidora is horrified at seeing Divina as Lola Nidora’s nanny. This might partly explain why YayaDUB was a bitter person on the first day that she appeared on EB Problem Solving. Before she saw Alden Richards, she doesn’t know how to smile. Not even if she’s a selfie enthusiast. And she is often viewed as way meaner and more snobbish than Lola Nidora ever was. It was a painful “demotion” from being a privileged kid in the household to becoming the household nanny. And Lola Nidora’s clingy tendencies were based on the thought of losing Divina to anyone that easily. Anyone including Alden Richards. 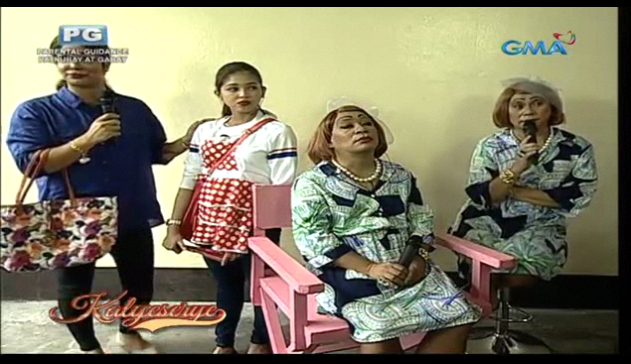 Lola Nidora showed a little regret at the ALDUB Road To Forever episode for the rash decision. 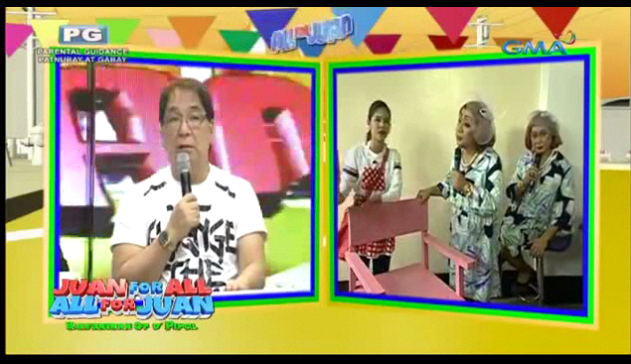 Donya Tinidora then asked Isadora again at the ALDUB Road To Forever episode. “Bakit hindi mo kinuha si Divina kay ate?” (Why did you not claim Divina from elder sister?) Isadora had to admit her reasons for going away. “Alam nyo, mga ate, kinailangan kong umalis noon dahil sa isang lihim ni Mama. Hindi ko matanggap.” (You know, elder sisters, I had to leave then because of Mama’s secret. I can’t fathom it.) Donya Tinidora can’t fathom it either. She can’t wrap around her head that her family had secrets this numerous. It’s as if she’s been away forever and returned to a fragmented reality. Isadora again prodded Lola Nidora to talk. “Sige na, ate. Tanggap ko na yun, ate. Nagsisisi na rin ako.” (Go ahead, elder sister. I have accepted it. And I have regretted it now.) YayaDUB was teary-eyed. She was overwhelmed just like Donya Tinidora at the ALDUB Road To Forever episode. Donya Tinidora was quick to comfort her one-time ward before losing Divina to Lola Nidora. It’s for the best as Donya Tinidora mentioned in the ALDUB Road To Forever episode. Lola Nidora answered after sensing that Isadora is too embarrassed to admit which Antonio fathered Ursula. “Si Antonio ang nagpintura ng ating bakod Ang apelyido ni Antonio ay Palais.” (Antonio painted our mansion gate wall. Antonio’s last name is Palais.) Isadora wanted to nip the topic in the bud real quick. “Bayaan na natin si Antonio. Maligaya na siya.” (Let’s leave Antonio alone. He’s happy now.) Apparently, he did more than paint the walls and the mansion. He painted the town red. At least that part of town where Isadora once lived as stated in the ALDUB Road To Forever episode. If Isadora didn’t want to talk about Antonio. Donya Tinidora went back to another hanging question. Why did Isadora come back? “Bumalik ako para malaman ni Yaya ang katotohanan. Dahil sa pagharap niya sa tamang panahon. Dapat alam niiya kung sino siya.” (I came back for nanny to know the truth. Because she is facing the right time. She should know who she is.) Scenes like these really make the Eat Bulaga Sa Tamang Panahon seem like a new chapter or book for YayaDUB. With this, Isadora embraced YayaDUB. Isadora then looked for Alden. “Alden, sana, hijo. Alagaan mo si Divina ha?” (Alden, hopefully, dear. You would take care of Divina, okay?) Alden may often forget calling YayaDUB as Divina. (He often ends up calling her Maine instead of YayaDUB or Divina.) But he clearly cared for the nanny he loved. He stood up in the ALDUB Road To Forever episode and tried wiping off Divina’s tears. It was a heartwarming gesture shown in the ALDUB Road To Forever episode. He sealed his affection with a kiss. Isadora returned her gaze to Divina a.k.a. YayaDUB. “Kung anumang paglalakbay ninyo, nandito lang ako. Alam kong maganda ang hangarin sa yo ni ate.” (Whatever journey you take, I’m only here. I know that elder sister’s intentions are noble.) Divina just nodded to accept Isadora’s advice. It was a clean takeaway towards the truck horn’s honking. Signaling the end of the ALDUB Road To Forever episode. Tune in to Eat Bulaga. Mondays to Saturdays at noontime. Like Eat Bulaga’s official Facebook page to catch the ALDUB Road To Forever episode replay. The countdown to Eat Bulaga Sa Tamang Panahon is still going on. Click here to check if there are any tickets left. Contact numbers are found on the Ticket World link as well for your perusal. Settling with your past for a better future. With tickets to Eat Bulaga Sa Tamang Panahon selling briskly. (And with the Ticket World link occasionally bogged down with the high demand.) This is far from over. Soon, the next episode recaps will be as jampacked as the ALDUB Road To Forever episode recap. For this, we invite you to follow us on our social media accounts. Like our official Facebook page, The Philippines Web. And follow us on Twitter @pinasamazing. We’d be expecting you.